It's great that Udon has translated this to English because now I can make sense of all the accompanying captions for the art and also the lengthly interview with the creators Kazuhiro Tsuchiya, Hiroshi Matsuyama and Seiji Shimoda. The interview talks about the idea, development and reception from the public. Since I've already reviewed the original Japanese edition アスラズラースオフィシャルコンプリートワークス back in 2012 when it first came out, I'll just duplicate the review here. 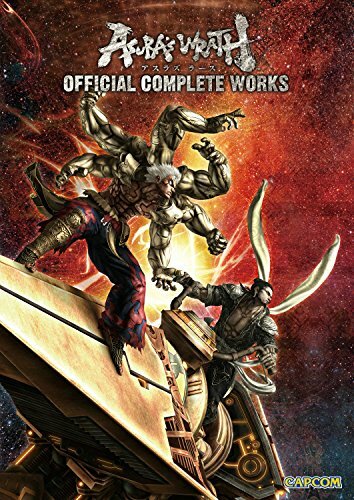 Asura's Wrath is a video game created by CyberConnect2 and Capcom, released in 2012. The 192-page paperback features concept art, character designs, storyboards and interviews. The concept art is an interesting blend of sci-fi and Hindu mythology, and actually influences from other mythologies since I see an entity that looks like the thousand-hand Goddess of Mercy but obviously is not. Characters have a godlike aura to them. In that sense, it's similar to God of War 3 but the art direction is totally different because of the setting. Character designs come in the form of 3D models as their appear in game, screenshots and detail concept sketches. There are breakdowns for different parts of each character. You can see the different variations of Asura's arms, intricate designs on the costumes, props and weapons and other ornaments. The art is great. The demigods look strong and the huge lava monsters are pretty cool. There are not many environment paintings or background art. Some of the good ones are too small as they appear in the form of screenshots. The chapter on storyboards has sketches and analysis of the key scenes, including the hidden ending. The last few pages of the book features more character sketches with line art in anime style as compared to the 3D ones shown at the start of the book. There are also imageboard of story sequences, relationship diagrams, unpublished comic art, merchandise designs and finally the 6-page interview with the creators. Fans of the game will enjoy this book. What a wonderful book. All the artwork that lead-up to the game is awesome. From a scale of 1 to 10 the game was a 1. I remember all the promotional work a year or two before the release of the game showed it to be a different type of combat game. If they release a sequel to the game I pray it's more along the lines of Darksiders one and two.